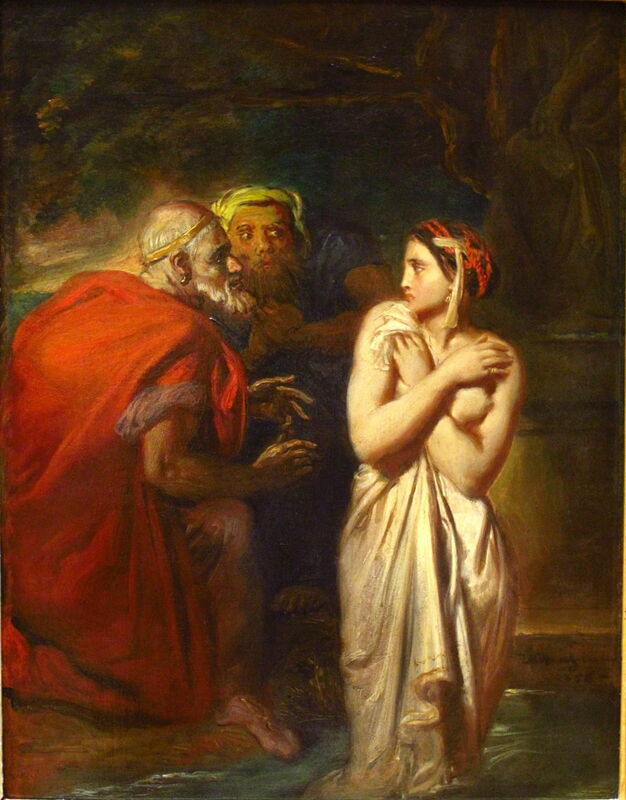 Théodore Chassériau (1819–1856), Susanna and the Elders (1856), oil on canvas, 40 x 31.5 cm, Musée du Louvre, Paris. Wikimedia Commons. There can’t be many artists who died before they reached the age of forty, but still have a whole room in the Louvre dedicated to their work, and a couple of paintings in the Musée d’Orsay too. Théodore Chassériau (1819–1856) does, and his other great legacy was his influence on Gustave Moreau and others. In fact, as I’ll show here, several of Moreau’s motifs and themes followed his mentor Chassériau. Chassériau was born to a French adventurer in what is now the Dominican Republic, when it was first a French then a Spanish colony. His family moved to Paris when he was a young infant, and his precocious skill at drawing was soon recognised. He started as a pupil in the studio of JAD Ingres in 1830, when he was only eleven years old. Ingres was struck by his talent, and rated him as his truest follower. But in 1834, Ingres was appointed as the Director of the French Academy in Rome, leaving Chassériau to fall under the influence of Ingres’ rival Eugène Delacroix. Within two years, in 1836, Chassériau had his first work exhibited at the Salon, where he was promptly awarded a third-class medal. Chassériau travelled to Rome in 1840 to try to heal the rift with Ingres, to no avail. Théodore Chassériau (1819–1856), Susanna at her Bath (1839), oil on canvas, 255 x 196 cm, Musée du Louvre, Paris. Wikimedia Commons. 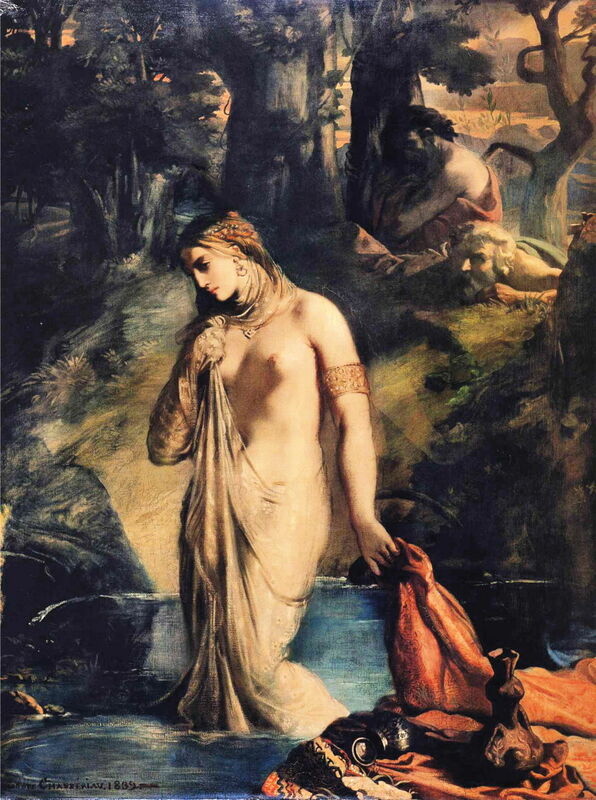 Susanna at her Bath, or Susanna and the Elders, from 1839, is among his most important early paintings. It shows a scene from the story in the Old Testament of this pious woman who was watched when she was bathing in her garden, by two voyeuristic elders. They tried to blackmail her into committing adultery with them, threatening to report that she had met a young man with whom she was having an adulterous relationship. Susanna stood fast, and was tried and sentenced to death. The young Daniel intervened, showed that it was the elders who had lied, as result of which it was they who were executed, and virtue triumphed. Chassériau shows the most popular scene, which here combines a delicate figure study of Susannah, with a condemnatory interpretation of the voyeurs behind. Théodore Chassériau (1819–1856), Sappho Leaping into the Sea from the Leucadian Promontory (c 1840), watercolour over graphite on paper, 37 x 22.8 cm, Musée du Louvre, Paris. Wikimedia Commons. His watercolour of Sappho Leaping into the Sea from the Leucadian Promontory (c 1840) seems to have been his first painting of the motif which was to become an obsession in Moreau’s paintings. 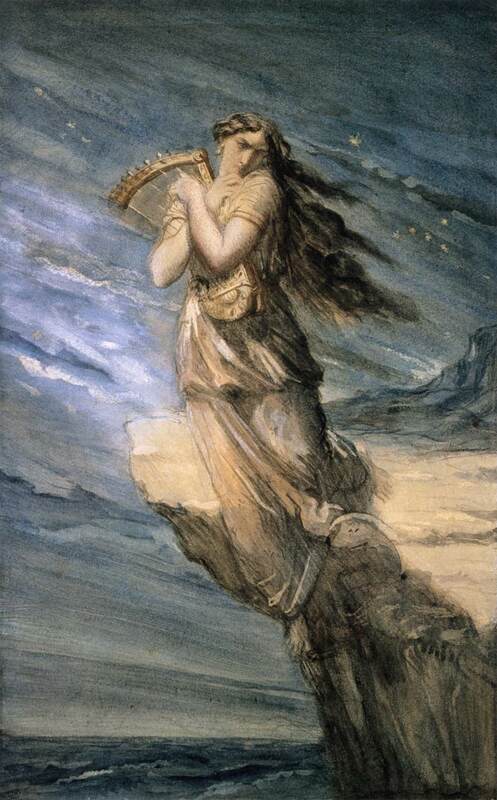 Here the Greek poet clutches her lyre, with her arms braced across her chest, as she steps off the edge of the Leucadian Cliff. Théodore Chassériau (1819–1856), Andromeda chained to the Rock by the Nereids (1840), oil on canvas, 92 x 74 cm, Musée du Louvre, Paris. Wikimedia Commons. Andromeda Chained to the Rock by the Nereids (1840) is an unusual depiction of a popular narrative scene, from the myth of Perseus and Andromeda. When Cetus, a sea monster, is devastating his kingdom, Andromeda’s father is advised to sacrifice her to appease Cetus. She is then chained to a rock by the Nereids to await her fate, as shown. Cetus is just arriving at the left edge (which appears to have been cropped badly, I am afraid). Also cropped from the left edge is Andromeda’s saviour, Perseus, who has recently killed Medusa the Gorgon. Andromeda’s face shows her abject terror, as the Nereids make haste to secure her before Cetus reaches them. In complete contrast to most of Moreau’s history paintings, Chassériau has followed the classical rules of Alberti in constructing his narrative, using facial expression and body language eloquently. When he was in Italy in 1840, trying to reconcile with Ingres, Chassériau visited the ruins of Pompeii. The buried Roman town there had been extensively excavated since its rediscovery in 1738. Théodore Chassériau (1819–1856) The Toilet of Esther (1841), oil on canvas, 45.5 x 35.5 cm, Musée du Louvre, Paris. Wikimedia Commons. Taken from another well-known and often-painted Old Testament story, The Toilet of Esther (1841) is less strongly narrative. It shows Esther, an orphan daughter of a Benjamite who had been living in exile in Persia. After becoming a member of King Ahasuerus’s harem, Esther dressed in her finest in order to successfully persuade the king to spare the life of her former guardian, and to execute his anti-Semitic grand vizier. In 1846, Chassériau travelled to Algeria for the first of several visits. He seems to have spent much of his time in and around the city of Constantine, in the north-east of the country, making copious sketches and drawings. On his return, he then worked those up into finished oil paintings which are among some of the finest of the ‘oriental’ works of the day. In 1844, Chassériau was commissioned to paint murals for the grand staircase of the Cour Des Comptes, which he completed in 1848. A monumental work, it was badly damaged when the building was set ablaze during the Paris Commune in May 1871 – an act of destruction which distressed Moreau. Recovered fragments of this are now preserved in the Louvre. Théodore Chassériau (1819–1856), Sappho (1849), oil on panel, 27.5 × 21.5 cm, Musée d’Orsay, Paris. Wikimedia Commons. 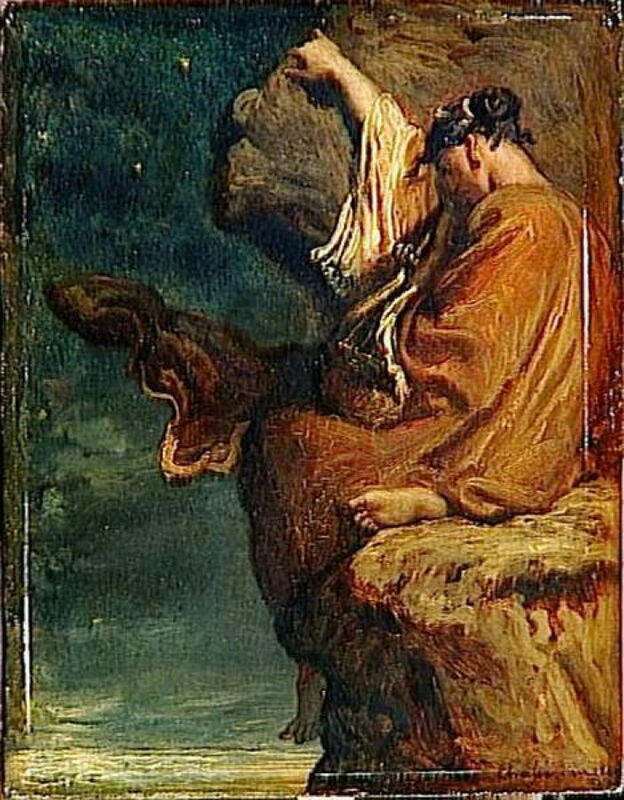 In 1849, Chassériau painted another version of Sappho about to throw herself from the Leucadian cliff. I apologise for its poor image quality. Théodore Chassériau (1819–1856), Woman and Little Girl of Constantine with a Gazelle (1849), oil on wood, 29.4 x 37.1 cm, Museum of Fine Arts, Houston, TX. Wikimedia Commons. 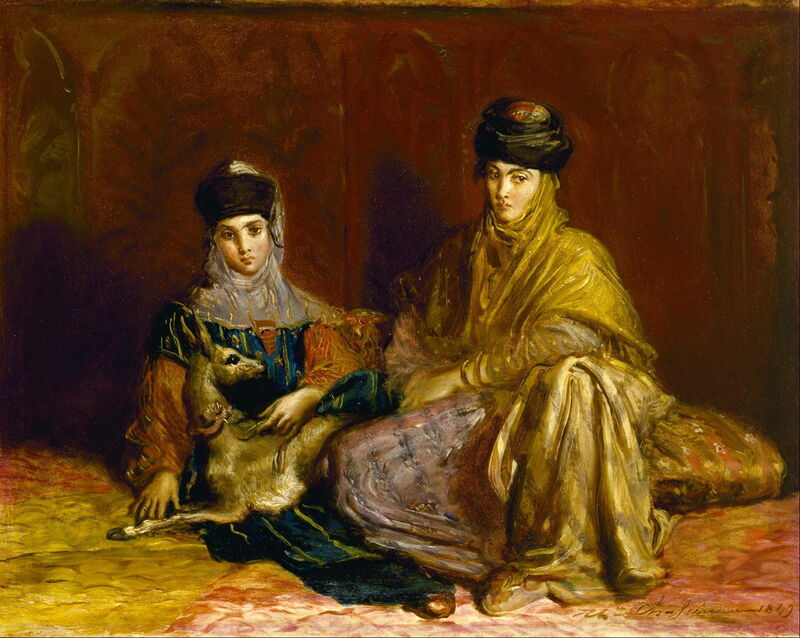 Woman and Little Girl of Constantine with a Gazelle (1849) is a very painterly work derived from Chassériau’s visits to Algeria, apparently based on his sketches of scenes in the city of Constantine there. Théodore Chassériau (1819–1856), Scene in the Jewish Quarter of Constantine (1851), oil on canvas, 56.8 x 47 cm, The Metropolitan Museum of Art, New York, NY. Wikimedia Commons. This part of Algeria had been seized by France in 1837, so when Chassériau visited, it was an integral part of France. 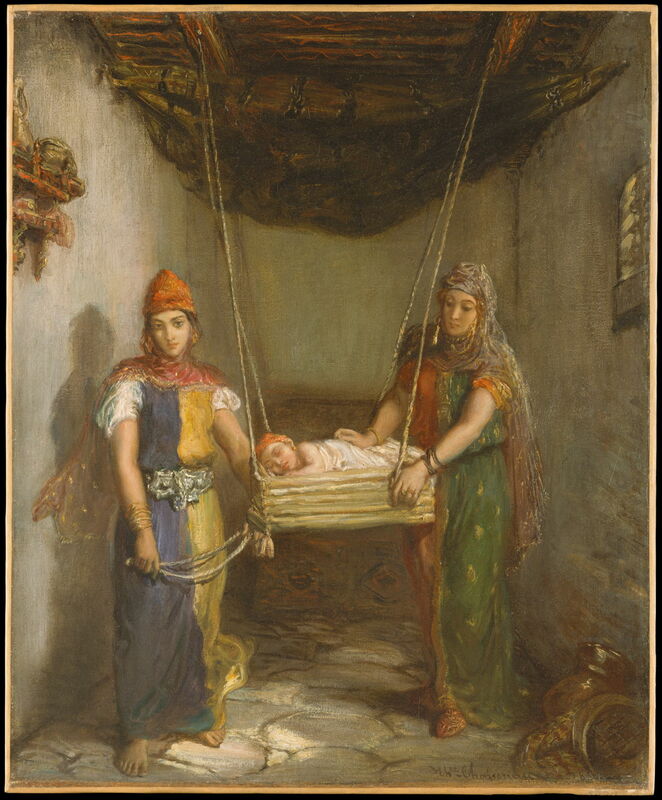 Scene in the Jewish Quarter of Constantine (1851) shows a mother and, presumably, her mother with an infant in an ingenious rocking cradle. Constantine is now the third largest city in Algeria, and has long had a substantial Jewish population. Théodore Chassériau (1819–1856), The Tepidarium (1853), oil on canvas, 171 x 258 cm, Musée d’Orsay, Paris. Wikimedia Commons. 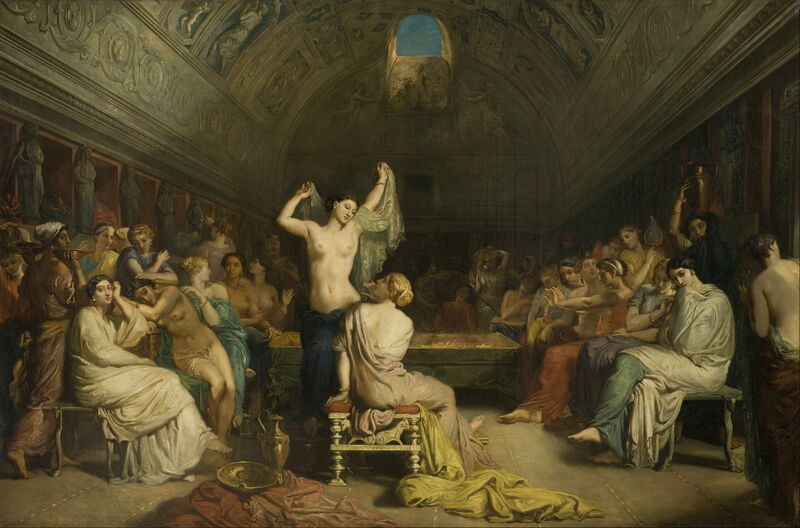 The Tepidarium (1853) was inspired by Chassériau’s visit to Pompeii, and shows a carefully composed group of women in the warm room prior to their proceeding to a hot or cold bath. It is traditionally understood to have been the most richly-decorated of the spaces in classical Roman baths. This painting was acclaimed when it was shown at the Salon. During his brief career, Chassériau also painted several scenes from Shakespeare’s plays, particularly of the tragedy of Macbeth. Théodore Chassériau (1819–1856), Battle of Arab Horsemen Around a Standard (1854), oil on canvas, 54 x 64 cm, Dallas Museum of Art, Dallas, TX. Wikimedia Commons. In 1854, Chassériau returned to his north African theme with his vivacious painting of a Battle of Arab Horsemen Around a Standard. 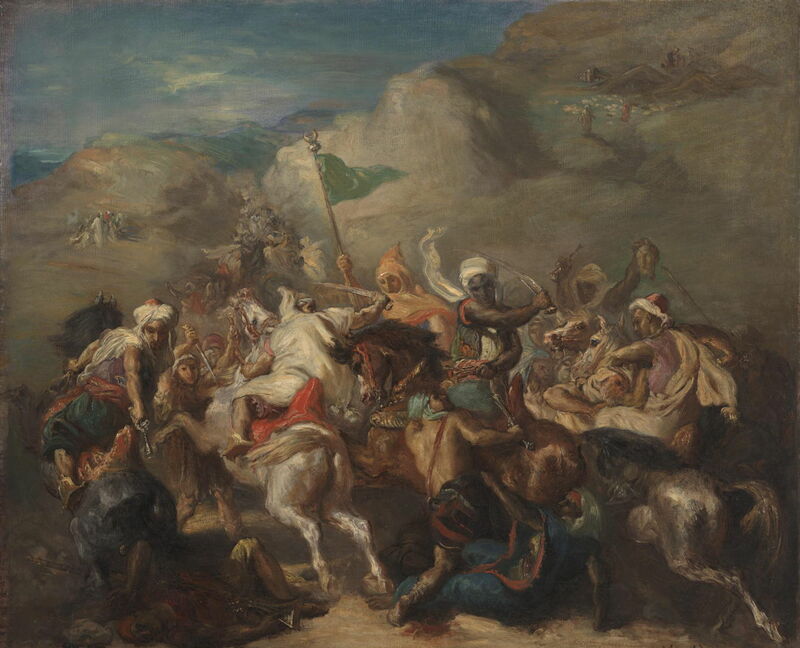 This shows the influence of Delacroix, and despite its wonderful painterly style, contains numerous details, such as the brandishing of a severed head, by one of the horsemen at the rear, mid-right. 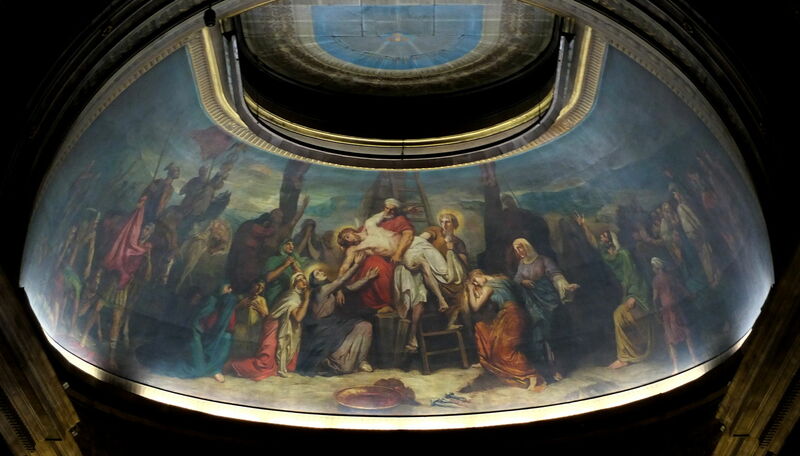 Théodore Chassériau (1819–1856), Descent from the Cross (1855), mural, 21.4 x 5.25 m, Chœur de l’Église Saint-Philippe-du-Roule, Paris (8e arrond.). Image by Siren-Com, via Wikimedia Commons. In the early 1850s, Chassériau was commissioned to paint murals in the Paris churches of Saint-Roch and Saint-Philippe-du-Roule, which he completed by 1855. Descent from the Cross (1855) is his vast mural for the latter, showing one of the most popular of the scenes from the Crucifixion, also known as the Deposition. Chassériau tackled this in a very conventional and traditional manner, using a composition which dated back to Rogier van der Weyden in about 1435. These huge works and his already deteriorating health combined to weaken him during the winter of 1855-56. He still managed to paint this powerful and intimate version of Susanna and the Elders (1856), though, before his health finally collapsed in 1856. He died that October at the age of only 37. I can see why Moreau held him in such respect, and why Ingres is alleged to have called him ‘the Napoleon of painting’. Posted in General, Painting and tagged Chassériau, Delacroix, Ingres, Moreau, narrative, painting, van der Weyden. Bookmark the permalink.